Doug and Max have sucessfully found Simon’s tree, they have paid their respects, mounted a MAG Motorcycle Action Group) plaque and added their names carved into the Boabab tree. Simon Milward, “Simon started a full time career working for the interests of motorcyclists with the Motorcycle Action Group United Kingdom. 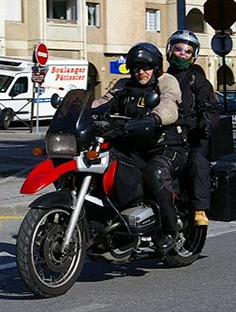 In 1992 Simon established the Brussels headquarters of the Federation of European Motorcyclists (FEM) in Brussels and became FEM’s General Secretary. Finding his way through the EU maze he started co-ordinating efforts towards specific ledgislatory targets. This resulted in bikers being among the first citizens to benefit from the democratic changes of the Maastricht Treaty and due to Simon’s never ending work, FEM became a well-known and effective lobby group in the EU institutions. In 1998 FEM merged with the EMA (the European Motorcyclists Association) to form the Federation of European Motorcyclists’ Associations (FEMA). Simon Milward became FEMA’s General Secretary. On January 1st 2000 Simon left Europe to fulfil a lifelong dream: to ride his handmade motorcycle around the world on a humanitarian mission. Tragically Simon passed away in 2005 following a road accident near the city of Kayes in Mali (Africa). 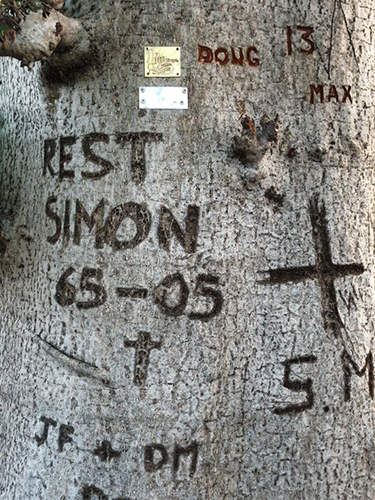 We found Simon’s tree in Mali thanks to GPS co-ordinates kindly supplied by Craig Carey-Clinch – one of the directors of Motorcycle Outreach and a long time friend of Simons. We paid our respects to Simon and nailed a commemorative plaque to the tree and we are now on our way home. Currently at Motel Barbas just North of the mauritanian / Moroccan border. Doug Smith & Max Jowett. The ride down to Mali was stunning and took is two days. The road started off really smooth and fast but soon deteriorated and the potholes started to come thick and fast and deep! At the end of the first day we were looking for somewhere to pitch the tents bit nothing much available. Going through one village a bike mechanic hailed us and I turned around and pulled over, I started to take pictures of the mass of kids and this broke the ice. Asking for somewhere to stay and finding out there was nothing for 200 kms. The bike shop owner then offered for us to stay at his house so he jumped on the back and we rode to a compound with his house inside. We ended up sleeping on the roof with him and a bunch of his mates but not before a nice street side meal of spicy chicken and ceremonial tea with computer shop owner. Woke before dawn and set off on road to Mali border. Road was horrendous and going was slow temp reached 37.5 degrees. Finally onto main road to border for a fast ride to frontier. Through border checks and visa granted. Another fast ish ride to find Simons Tree, got there without problem, mounted MAG plaque and carved our names in the Boabab tree and had to camp there overnight as light was gone. Hot hot hot night soaked with sweat.